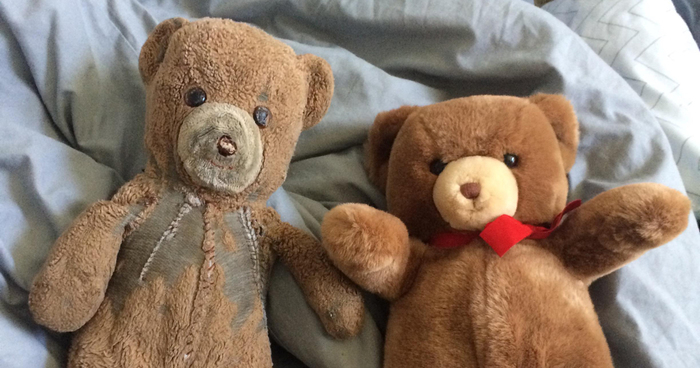 In 1985, one mom bought her son two identical teddy bears – one for him to play with, and one was placed in storage for him to give to his own children when he grows up. 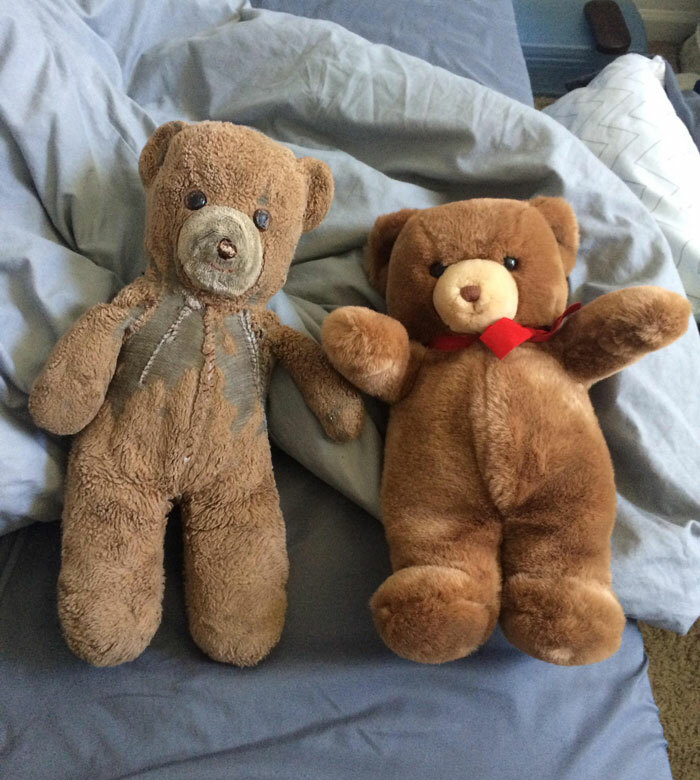 Now that his first child was finally born, his younger brother created a photo comparing the two reunited teddies. The younger brother, who posted the two photos on Reddit, wrote that the played-with bear had “been on many vacations, gotten soaked in pool water time and time again, and got lost on a theme park ride at Disney World. It has certainly seen a lot.” If you've still got your childhood teddies with you, you can add their pic to this post below! "When my brother was born in 1985, my mother purchased two identical teddy bears. The one on the left has been my brother's for 30 years, the one on the right has been kept in storage for my brother's first child who was born today"
Add photos of your own childhood toys below! #1 Mine And My Twin Brother's Teddy Bears From 1992. Bare In Mind That One Of Us Is Disabled From Birth And In A Wheelchair To This Day. How do I add a photo?? Omg my husband has one exactly like this. Do you know anywhere we could find another one? #3 Here Is My New Teddy And Old Teddy. What did you do to that teddy?? The old one is looking like a koala. #8 Ruffus The First, And Ruffus The Second For My Little Boy, Due This September. 26 Years Apart. #10 33yrs Old Teddy Born In Boston, Raised In Mexico, World Traveller, Once Lost In Central Park Nyc For 6 Days!! #12 Bad Dream Keepers - Blue One Is 27 And The Pink One Is 18 Years Old. Made By My Grandmother. The pink one was supposed to replace the blue one, but I just saw it as a bonus. #18 I've Had Larry For 31 Years (on The Right) My Mom Gave Lucy To Me (left) 21 Yrs Later. I guess there would be bigger difference if this photo was 10 years older? #19 My 27 Years Old Funshine Bear Since I Was 5. He Has Been With Me Through My Ups & Downs. #20 23 Year Old Toutou And What He Used To Look Like. 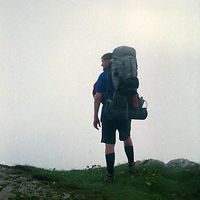 Lived In France, Gabon And Canada. #21 Meet Teddy. My Best Friend For 39 Years. #22 My 35 Year Old "noopy" Has Been Commendeered My My 2 Year Old! #23 My 32 Year Old Teddy Cat "sabrina" & An Original 1979 Untouched Version I'm Just About To Buy! Ah, I still have that exact same Sabrina kitty from when I was little!! Looks just as loved as the older one, identical. #24 My Well Loved Big Puppy Born In 1985 (on The Right) And A "fresh" 1985 Gund I Found On Etsy. #26 This Is Bear, He's 36 Years Old, And Used To Be A Pink Teddy Bear! Very Well Loved! #28 My Dog Boomer That I've Had For 32 Years. #30 My First Sleepingmate (39 Years Old) And Me. #32 Celebrating 25 Years Of Togetherness. They Are Part Of My Family. #43 I Have This Teddy From When I Was 3. I Guess It's His 25th Birthday This Year. #44 Jason (right, 36 Years Old, Bought) And Topolino (left, Sewed By My Mum, 5 Years Ago). #47 My Pooh Bear, That Is 20 Years This July And Lives In My Bed Whereever I Call Home! I feel like a sacrifice has occured..
#51 'ted'. 37 Years Old. Only Dad Was Allowed To Fix Him. Well Loved. #54 My Sister's Four "pippolinos"
#55 Good Friends. My Brother's 21 Years Old Teddy Bear Named Bumi And My 33 Years Old Monkey. Poor monkey! What has he been through?! #56 Imagine My Excitement When I Found A Brand New Dixie For My Brand New Daughter!!! #60 My First, Second And Third Pandabear. The Same Model, About 5 Years Apart From Each Other. #61 Mine And My Older Sister's Teddy Bears From 1987. We Got Them As Gifts On The Day I Was Born. I had a very similar bear - I had a lot of white fluffy bears (explains my love of polar bears!) He must be somewhere in my bear pile at mums. #64 Hard To See. Original Bear Is Basically Flat And Floppy, Very Worn And Thread Bare. Constant Companion Of A 6 Year Old Autistic Boy. #66 This Is Roger. Have Had Him All My Life (29 Years). Never Go On Holiday Without Him. #67 My Bunny Since I Was 3, He Will Be 20yrs This November. #70 Bubu, Been Through A Combine Harvester. 23 Years Old. Lol. This is one of the strangest teddy bears I've ever seen. And I've seen a lot! #72 My Much Loved 'perdita' And Twin! #73 Martin, 55 Years Old. New Nose From 1965 And Outfit From 1975. I'm so in love with Martin. #74 Teddy Joined My Family In 1984 And We Have Been Best Buddies Since!! #75 Anyone Remember Holly Hobbie? Mine Is 38 Years Old. I remember Holy Hobbie! I had 2 with interchangeable clothes an this other with magnetic clothes!! #76 Grandmom's Teddy Bear 50 Years Old And Grandmom's Granddaughter 5 Months Old. #79 #80 13 Years Old...pooh Travels Through Time. I love this. When my son was little he called his bear Blue Beer or just Beer. When he was about 3 yrs old he told our neighbors that I gave him "Beer" every night so he would go to sleep! I like stuffed animals as well as many other toys but things destroyed my childhood things. your spamming made me cry too... thanks for ruining an otherwise great thread.